It seems only fitting that my final post of Vegan Mofo features my book, Party Vegan. After all, this past month of bloggers getting together in cyberspace to swap photos, stories, and delicious vegan recipes was like the ultimate vegan party! In keeping with the Party Vegan theme, I want to share more of the great Party Vegan tester photos taken by Tami at Vegan Appetite when she tested these recipes for the book. Now on to the Cookbook Contest Winner: I hope you all enjoyed reading all the comments about how everyone likes to “Party Vegan” — I know I did. Lots of really great ideas! But as you know, ther can only be one contest winner (at a time, anyway!) Chosen randomly by that great computerized oracle at Random.org, the winner of a copy of Party Vegan is: Carla — who likes to party vegan by “bring desserts to share.” Congrats, Carla! Please e-mail me with your address and I’ll get a book right out to you. I want to thank all of you who participated in my special giveaways and to those of you who only recently discovered my blog during Vegan MoFo, I hope you’ll keep coming back for more recipes, photos, contests, and general food musings (with the occasional cat photo for good measure). Ever since I can remember, I’ve always liked to play with my food. Like most kids, I liked to make mashed potato moats for the gravy but that soon escalated to stirring ketchup into mashed potatoes until it was just the right shade of pink and then festooning it with a necklace of green peas. When I was a bit older, I made an entirely blue dinner. It should be easy to understand, then, why having a wealth of Thanksgiving leftovers is an especially fun time in my house. The day after Thanksgiving we enjoyed the obligatory let’s have “another one just like the other one” with a delicious instant replay of the previous day’s feast. But then, the rest of the leftovers were mine for the creating. Creation #2: The Leaning Tower of Thanksgiving. I stacked layers of all the Thanksgiving dishes into one mighty tower and surrounded it with a cranberry-port wine sauce made with leftover brown gravy, cranberry sauce, and a generous amount of port. To serve, I sliced it right down the middle and arranged each half, cut side down on a plate with more of the luscious sauce. Leftovers never tastes so good. This is my 20th Vegan Mofo post! I’m excited that I made it this far, considering what a crazy-busy month this has been. Tomorrow, Vegan Mofo ends with the announcement of the winner of my Party Vegan giveaway. If you haven’t entered yet, do it now — contest closes at midnight tonight! 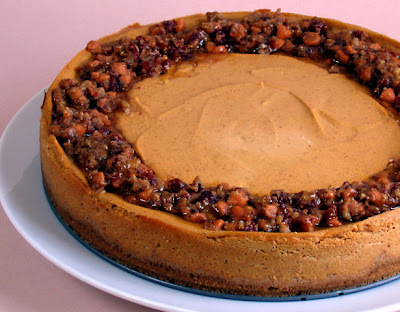 This year’s Thanksgiving pumpkin cheesecake was similar to the one I make every year, but as usual, I just had to do something a little different for the topping to keep it interesting. This time, I made a streusel-type topping by combining pecans, dried cranberries, and vegan butterscotch chips. 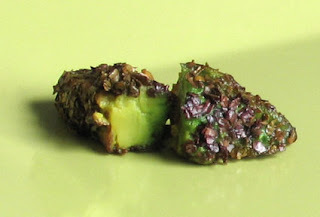 I pulsed them in a food processor to chop them up well and stirred in a little agave. Instead of covering the entire top, I just framed the outer rim with the streusel. As Jon said when he had his first (!) 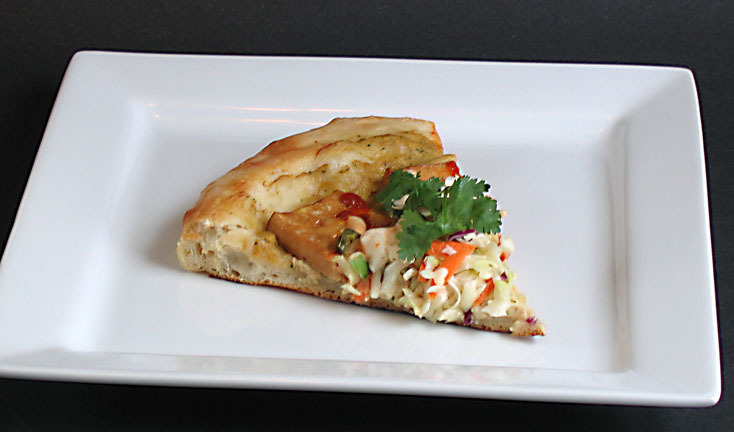 slice, “You start out thinking you’re eating the best thing in the world, and then you get to the part with the topping on it and it’s even better.” With that kind of review, I think this new topping may just have to make the rounds again next Thanksgiving! Hope you all had a great Thanksgiving! There's still time to enter my final Weekly Vegan MoFo Cookbook Giveaway! Just leave a comment here for a chance to win a copy of my new book, Party Vegan! Kabocha Soup with Coconut-Sriracha Swirl + Party Vegan Giveaway! Can you stand one more post featuring the illustrious kabocha squash? It’s not that I’m obsessed with kabochas, well okay, maybe I am. But in a good way. The really reason they seem to be taking over my kitchen recently is because I usually have to drive an hour to find any and when I do, I buy several and roast them up to use in various ways. Sure I could scoop the brilliant orange goodness into freezer containers to use another time (and I do) but I also keep some out to enjoy in different ways, as you’ve noticed if you’ve been following my blog. Today, it’s soup! It was so easy to make, it doesn’t even need a recipe. Just cut the squash in half, scrape out the seeds and roast the squash until very soft. I roasted this one with some shallots and then scooped the pulp into a my Vitamix (a food processor would work too) and added a couple roasted shallots, some coconut milk, a little vegetable broth, a touch of sriracha, a little grated ginger and lemongrass, and salt (to taste). Then I just blended until very smooth and that was it. I had reserved some of the thick coconut milk from the top of the can to garnish the bowls of soup, and a little extra sriracha as well. 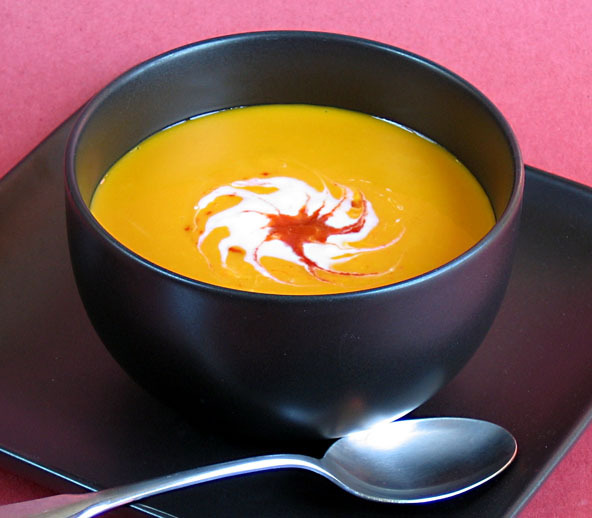 The great thing about a soup like this, is you can easily change up the flavors, using different seasonings. For example, use almond milk instead of coconut milk and swap the sriracha for chipotles in adobo, a little cumin instead of ginger and lemongrass, and you’ll have a vastly different flavor profile. Now for the moment you’ve been waiting for: another cookbook giveaway contest! This is the 4th and final giveaway to celebrate Vegan Mofo. The winner will be chosen at random on 11/29 at midnight and announced on Tuesday, November 30 — the final day of Mofo! 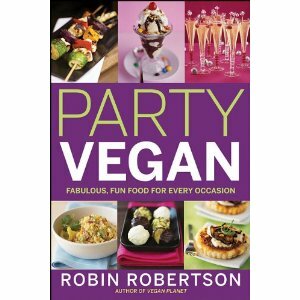 This week’s prize is a copy of my newest book: Party Vegan! Party Vegan isn’t just about cooking for holidays and special occasions, although there’s lots of that in there too. But it’s also about casual meals and celebrating the little things with family and friends. So the question to answer in order to enter the contest is this: “How do you like to ‘party vegan’?” Just leave a comment at the end of this post. Thanksgiving Notes:I'm very excited to announce that some of my Thanksgiving recipes are featured on the Food Network site. For these and more of my holiday recipes, visit Vegan.com. You can also find some of my recipes in the VegNews Holiday e-book and in Nava Atlas' Thanksgiving e-book. 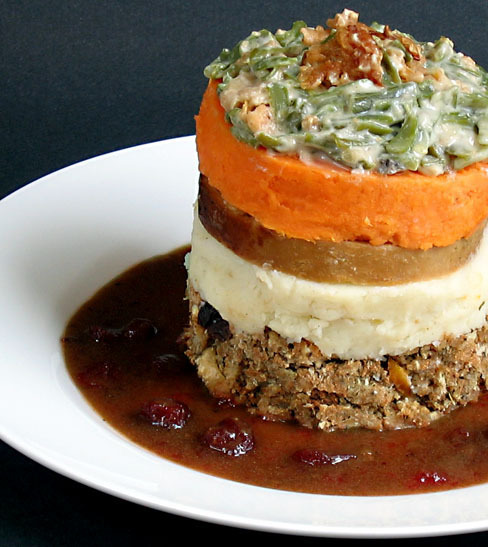 With all these sources, there's no excuse not to have a vegan Thanksgiving dinner! Pan-Seared Picatta Portobellos with Brown Rice Potato Cake + Cookbook Contest Winner! I said it before and I’ll say it again — I love leftovers. Some of my favorite meals came into existence by using up a bit of this and that. 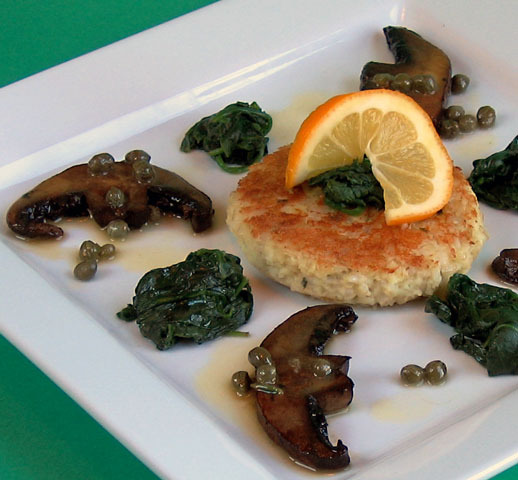 Take this dinner of pan-seared portobello mushrooms, spinach, and brown rice potato cake. It was the result of needing to use up a few stray items in the fridge before going shopping. The spinach and mushrooms were delicious, but the real star of the meal turned out to be the happy marriage of leftover mashed potatoes and cooked brown rice. When mixed with some seasonings and sauteed, the brown rice and potatoes transformed into a third entity with a wonderful texture and flavor that provided an ideal companion for the mushrooms and spinach all complemented by a tangy lemon-caper sauce. Everyone else: Check back tomorrow for the 4th and final cookbook giveaway during Vegan Mofo. Every now and then I come up with a meal on the fly that exceeds my own expectations. This voluptuous pasta dish did that for me this weekend — and then some. I can’t even begin to describe the creamy smooth richness of the vibrant sauce, most of the credit for which goes to the inherently delicious flavor of the kabocha squash itself. As you probably know, I’m like the number one fan of kabocha squash (also known as Hokaido pumpkin). Its natural sweetness and rich depth of flavor far outshine any other variety of squash anywhere. If you have a chance to buy one, do yourself a favor and try it. Once you do, you may have trouble going back to any other kind — I know I do. 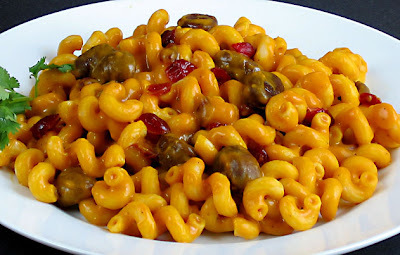 Okay, so if this wonderful sauce weren’t enough to make this pasta dish fantastic, the roasted chestnuts and dried cranberries really put it over the top. In addition to adding texture and flavor, the combination of squash, chestnuts, and cranberries made it a perfect autumn meal. The pasta just made it even better! There's still time to enter! The contest to win a copy of Vegan Fire and Spice ends tonight at midnight . If you haven’t entered yet, enter now. Then check back tomorrow to find out who won. Coming Wednesday: a new (and final) Weekly MoFo Cookbook Giveaway! With Thanksgiving less than a week away (yes, really!) 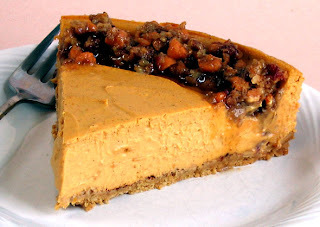 it seemed appropriate that today’s Flashback Friday post be about my favorite Thanksgiving dessert: pumpkin cheesecake. The cheesecake in the photo is from last year because I won’t be making it this year until next Wednesday, and by then it may be too late for you to decide that you want to make it too! 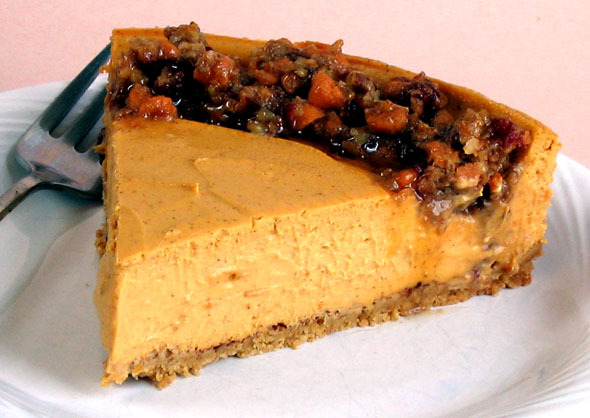 I’ve been making pumpkin cheesecakes every Thankgsiving for decades and each year I like to change it up a little. Sometimes I add a splash of rum, other times I dust it with crystallized ginger or top it with glazed pecans. This particular version is from 1,000 Vegan Recipes in which I top it with a cranberry drizzle. The photo also shows the added garnish of glazed pecans (I can't leave well enough alone!). This was so good last Thanksgiving, I think I’ll make it this way again next week. What do you plan to make for dessert this Thanksgiving? Dense and rich with spiced pumpkin flavor, this dessert is a natural for your Thanksgiving table. The gorgeous orange color offset by the vivid drizzle of cranberry makes a beautiful presentation. From 1,000 Vegan Recipes by Robin Robertson © 2009, John Wiley and Sons. 1. Make the crust: Preheat the oven to 350ºF. Grease a 9-inch springform pan. Place the crumbs in the bottom of the pan, add the melted margarine, and mix with a fork to blend. Press the crumb mixture into bottom and sides of pan and set aside. 2. Make the filling: In a food processor, combine the cream cheese and pumpkin and process until blended. Add the sugar, cornstarch, cinnamon, allspice, and nutmeg and process until well blended. 3. Pour the filling into the prepared crust. Bake for 45 minutes. Turn off the oven and leave cheesecake in the oven for another 15 minutes. When done, edges should be golden and starting to pull away from sides of pan, and center should be soft set. Remove the cake from the oven and cool at room temperature for 1 hour. Refrigerate for at least 3 hours before serving. 4. Make the drizzle: In a blender or food processor, combine the cranberry sauce, maple syrup, and margarine and blend until smooth. Pour the mixture into a squeeze bottle or small pitcher and drizzle the over the top of the cheesecake. Keep refrigerated. NOTE: When made in a 9-inch springform pan, this cheesecake isn't very "tall" -- if you prefer more height, make it in an 8-inch springform pan or add an extra 8 ounce container of vegan cream cheese to the batter, along with a little more sugar and spices, to taste. Let’s talk green beans. There are so many great ways to enjoy them, from a Nicoise salad to an updated vegan green bean casserole. But I think my favorite has to be Szechwan green beans. Trouble is, when you get them from a Chinese restaurant, they can be too oily. That’s why I make my own version that uses a fraction of the oil. Also featured in that menu are recipes for a yummy appetizer called Pearl Balls, a spicy Hot and Sour Soup, and Pineapple and Scallion Brown Rice. When prepared together, you have a veritable Chinese banquet. When prepared individually, you have several great reasons to eat in instead of ordering take-out. Spicy and crisp-tender, these green beans are as flavorful as any you’d find in a Chinese restaurant. 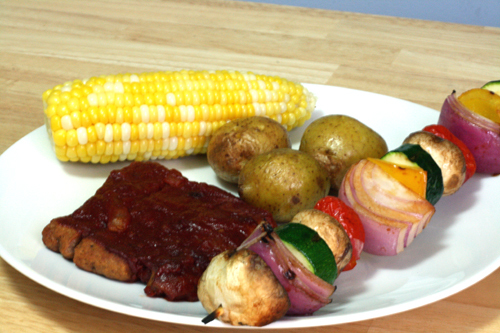 From Party Vegan by Robin Robertson © 2010, published by John Wiley and Sons. 1. Steam the green beans until just tender, about 6 minutes. Rinse under cold water and set aside. 2. In a small bowl, combine the soy sauce, ginger, sherry, chili paste, cornstarch, and sesame oil. Set aside. 3. In a large skillet or wok, heat the vegetable oil over medium-high heat. Add the shallots and bell pepper and stir-fry until softened, 2 to 3 minutes. Add the garlic and stir-fry 30 seconds longer. Add the green beans, then add the sauce to the skillet. Season with salt and black pepper, to taste. Cook, stirring, until the sauce comes to a boil. Continue cooking and stirring until the beans are coated, about 3 minutes longer. Serve hot. 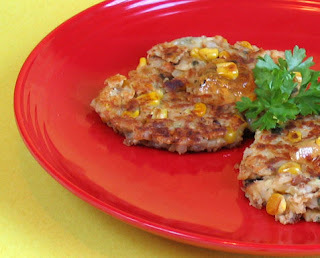 Spicy Corn Fritters with Corncob Jelly + A New Cookbook Contest! If you follow me on Facebook, you may recall that a couple weeks ago I saw corn cob jelly for sale and had to buy a jar — I mean, who wouldn’t, right? Of course, once I got the jar home I had to figure out what to do with it. Enter: Spicy Corn Fritters! I sometimes serve corn fritters with a little maple syrup, so I knew that corncob jelly would probably taste good, and I was right. What really put these babies over the top, though, was adding a bit of heat to the fritter mixture. I added some chipotle chili powder and a little cayenne, but you could also add minced chipotles in adobe or some other kind of chile. 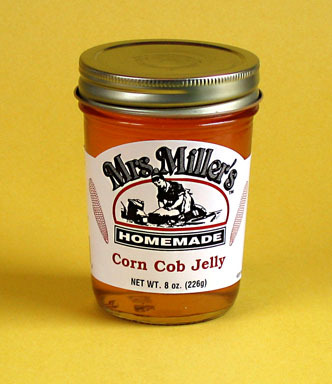 As for the corncob jelly itself, well, the taste of corn is barely perceptible. It’s a lot more fun just looking at the jar! Now for the moment all y’all have been waiting for: my special weekly Vegan Mofo cookbook giveaway! This week the prize is a copy of my cookbook Vegan Fire and Spice. To enter the contest: leave a comment at the end of this post telling me your favorite spicy food — it could be a single ingredient or condiment or an entire dish. The contest closes midnight EST on 11/22. Winner will be chosen randomly and announced on Tuesday, 11/23. 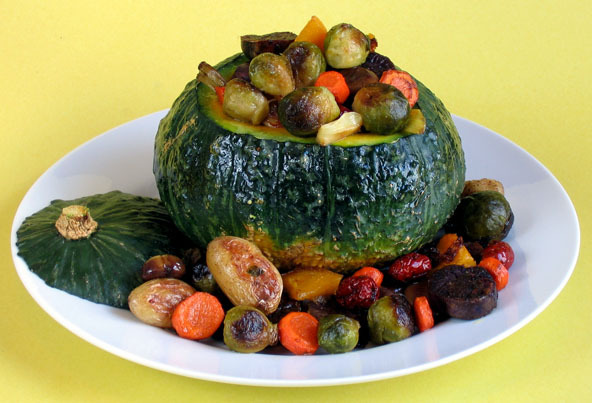 Roasted Vegetables in a Kabocha Bowl + Contest Winner! The combination of vibrant vegetables and squash together looks so gorgeous on the table, it’s guaranteed to steal the show on Thanksgiving (or anytime). It’s kind of like a vegetable cornucopia, but with a kabocha squash standing in for the cornucopia. Looking for more great ideas for Thanksgiving? Tips and recipes from Party Vegan are popping up all over! Check out my Thanksgiving tips in this VegNews article. 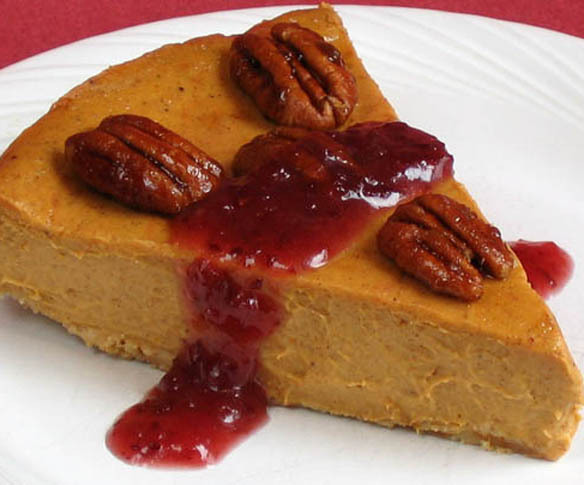 And visit the Daily Meal for some of my Thanksgiving recipes including Chestnut Bisque, Porcini Stuffed Seitan with Wild Mushroom Sauce and Pecan Pumpkin Pie. Unscientific Poll Results: A quick glance through all 115 comments from this last contest reveals that chickpeas win by a landslide as the favorite pantry ingredient! Pie for Thanksgiving? No, I’m not talking about eating dessert for dinner. I’m referring to a savory pie that includes all the flavors we love about Thanksgiving (stuffing, gravy, mashed potatoes) in one easy to assemble dish. 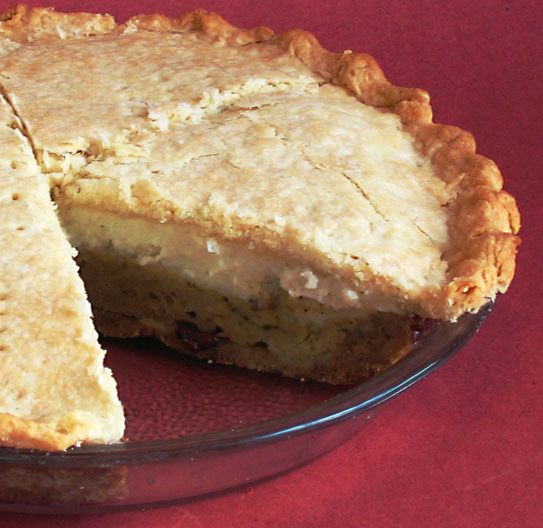 As you may recall, I’m totally crazy about my vegan version of my family’s traditional Italian Easter Pie — a savory concoction of spicy vegan sausage and tofu baked in a pie crust. 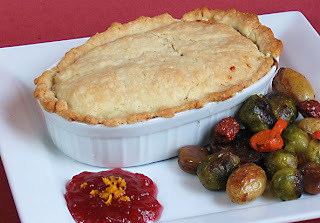 With Easter Pie as inspiration, I took the elements of my Almost One-Dish Thanksgiving Dinner recipe from 1,000 Vegan Recipes and baked it in a pie plate instead of in a baking dish. The “almost” in the recipe title comes from the fact that I don’t include a layer of vegetables — that’s because the veggies look much better served alongside. 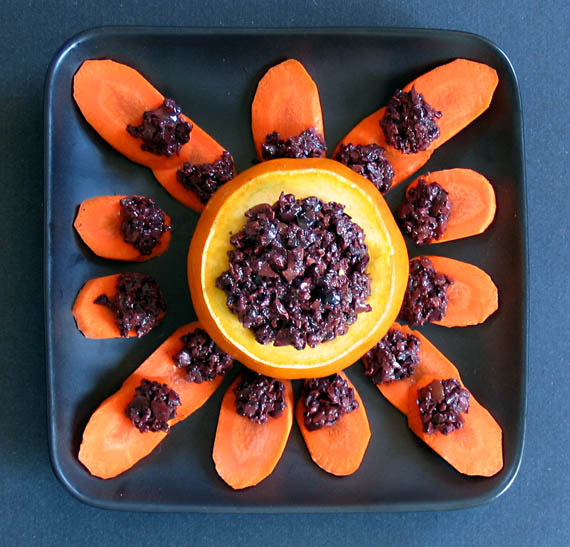 And even though cranberries are represented in the recipe, I also like to serve cranberry sauce as a colorful side dish. Some of the other variations for this recipe include making several individual Thanksgiving “pot pies” (shown here in a small gratin dish with roasted veggies — more about those vegetables tomorrow!). I’ve also been known to transform the components of this recipe into a Shepherd’s Pie, omitting the top pastry crust layer, so the mashed potatoes become the top layer. Since the gravy tends to get absorbed into the seitan and stuffing, I also have an extra bowl of hot gravy ready to add more at the table. In the original recipe (below) I use a sheet of puff pastry for the top layer. For the pie versions I used a regular pie dough for the crust. Both work great. 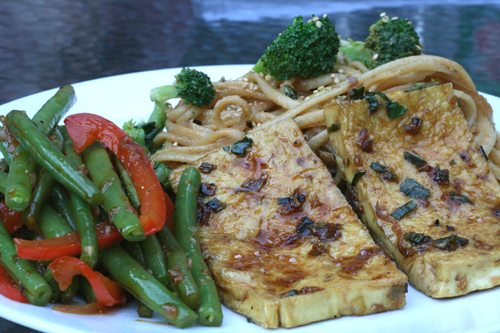 If you’re not a fan of seitan, you could just go with a layer of sauteed and pressed extra-firm tofu (instead of simmering the tofu in broth). Other options (instead of or in addition to tofu or seitan) are adding crumbled vegan sausage or extra chestnuts, pecans, or walnuts to the stuffing portion. Whichever version you choose to make, the Almost One-Dish Thanksgiving Dinner can be assembled in advance and is a fun and delicious way to enjoy the flavors of Thanksgiving. It’s a great “take-along” dish to bring to a Thanksgiving potluck, too. Other than your favorite vegetables (green bean casserole anyone?) this amazing recipe has it all, including “white and dark 'meat'” (tofu and seitan), stuffing, mashed potatoes, and gravy. There’s even a golden brown crust that fills in nicely for hot rolls. Note: use this recipe as a basic for any of the spin-offs described in this post, including individual pot pies, a Shepherd's Pie, or in a pie plate. You can also make a larger version to fit in a 9x13-inch baking dish. Make it your own by using your own favorite stuffing, gravy, or other ingredients. Preheat the oven to 400°F. Lightly oil a 10-inch square baking dish. In a large skillet, heat the oil over medium heat. Add the onion and celery. Cover and cook until softened, about 5 minutes. Stir in the mushrooms, thyme, savory, sage, nutmeg, and salt and pepper, to taste. Cook, uncovered, until the mushrooms are tender, about 3 minutes longer. Set aside. 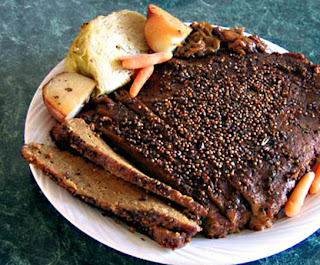 Spread half of the prepared stuffing in the bottom of the prepared baking dish, followed by half of the seitan, half of the tofu, and half of the brown sauce. Repeat layering with the remaining stuffing, seitan, tofu, and sauce. Spread the mashed potatoes evenly over top. Roll out the pastry and place on top of the potatoes. Pinch down the edges of the pastry to seal in the filling. Use a sharp knife to make a few slits in the top. Bake until the crust is golden brown, about 45 minutes. Serve hot. 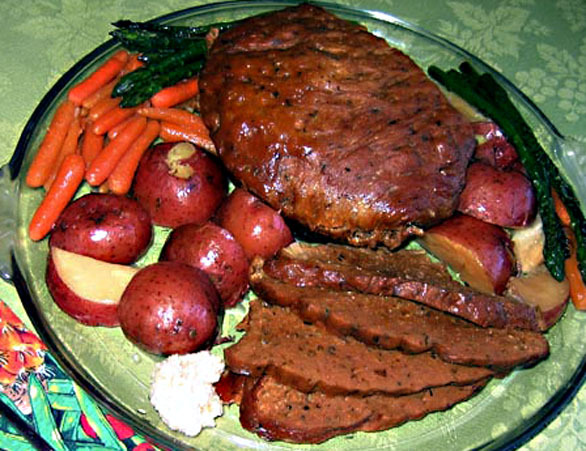 I also like to occasionally change things up, pot-roast wise, and cut the seitan into smaller chunks before adding to the slow cooker. I think that may give it a bit more flavor from being more exposed to the broth and veggies. For more of a “stew” effect, you can even cut the seitan into bite-sized pieces. Regarding slow-cooker cooking times, I can’t stress enough how much time variance there is among the different slow cooker models. The best advice is to get to know your own slow cooker and adjust accordingly. You may have to “lift the lid” a couple times to test for doneness until you are familiar with your cooker and how long it takes for things to be done. And at Vegan Appetite, Tami is giving away a copy of my book, Party Vegan. Check it out! 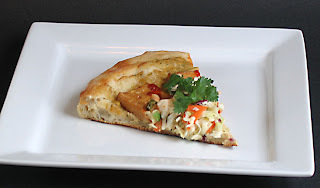 Tami also posted some great recipe photos and review of the book. And so ends the second week of Vegan MoFo! It’s apple time here in the Shenandoah valley, with orchards and farmstands overflowing with countless varieties of the delicious fruit. We’re down to our last three Galas so a trip to a local orchard is in our plans for the weekend. 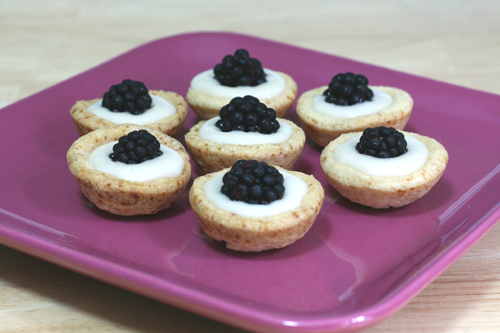 The tart is the featured dessert in Party Vegan’s Christmas menu, but would also be great for Thanksgiving if you want to serve something besides (or in addition to) pumpkin pie. Mom’s apple pie gets an update with this classy tart made with two kinds of apples and a creamy, luscious cider sauce. (Note: the tart is great without the sauce too.) 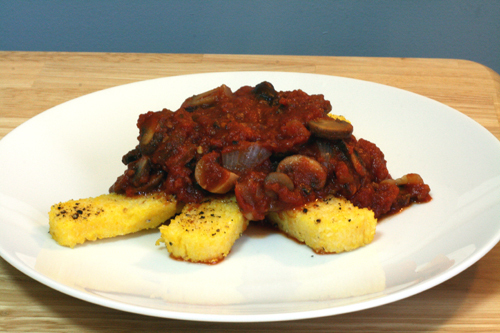 Recipe is from Party Vegan by Robin Robertson © 2010 published by John Wiley and Sons. 1. Make the crust: In a food processor, combine the flour, margarine, sugar, and salt and pulse until crumbly. With the machine running, add the water and process to form a dough ball. Remove the dough, flatten into a disk about 1-inch thick, wrap it in plastic wrap, and refrigerate for 30 minutes. 2. Roll the dough out into a 12-inch circle on a lightly floured work surface. Transfer the dough to a lightly greased 10-inch tart pan with a removable bottom, fluted quiche pan, or pie plate, pressing evenly with your fingers to fit it into the pan, trimming the edges. Preheat the oven to 400°F. 3. Make the filling: Peel and core the apples and cut them into halves. 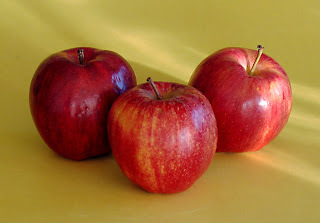 Cut the apples into very thin slices. Spread about half of the apple slices evenly over the surface of the pie crust. Sprinkle with the cinnamon and 1 tablespoon of the sugar. Arrange the remaining apple slices overlapping in concentric circles, beginning with the outer layer and working toward the center. Sprinkle the remaining 2 tablespoons sugar on top of the apples, dot with bits of the margarine, and bake until the crust is cooked through and the apples are tender, about 45 minutes. Remove from the oven and brush the top of the tart with the melted apple jelly. Cool at least 30 minutes before serving. 4. Make the cider crème: In a saucepan, combine the sugar, cider, and maple syrup. Bring just to a boil, over medium-high heat, stirring constantly. Reduce heat to medium-low and cook, stirring, for about 2 minutes to blend the flavors. Remove from heat and stir in the vanilla. Place the softened cream cheese in a bowl. Slowly add the hot cider mixture in batches, stirring to blend after each addition, until desired consistency is reached. Stir until well blended and smooth. 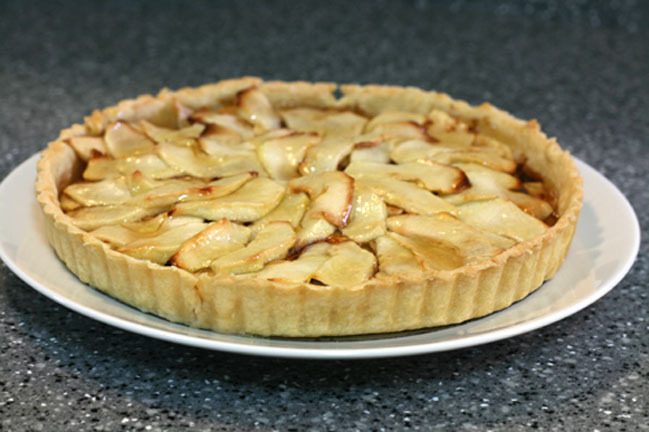 To serve, cut the tart into slices, plate, and serve with the cider crème. 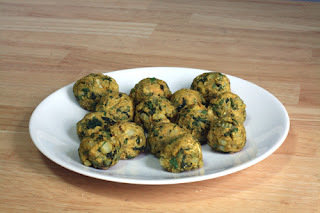 Spinach and White Bean Fritters + A Cookbook Giveaway! Yes, it’s that time again — another weekly cookbook giveaway to celebrate Vegan Mofo! This week, the prize is a copy of Vegan Unplugged: A Pantry Cuisine Cookbook and Emergency Guide. My husband Jon wrote this book primarily as a way to eat well when the power goes out, but it's also great for camping or when the fridge is bare or you don't feel like cooking. I developed the recipes for the book using only nonperishable pantry ingredients. Among them are: Almost-Instant Black Bean Chili, Samosadillas, Fire-Roasted Blueberry Cobbler, and one of my favorites, Ginger-Walnut Rum Balls. All the recipes can be ready in 15 minutes. 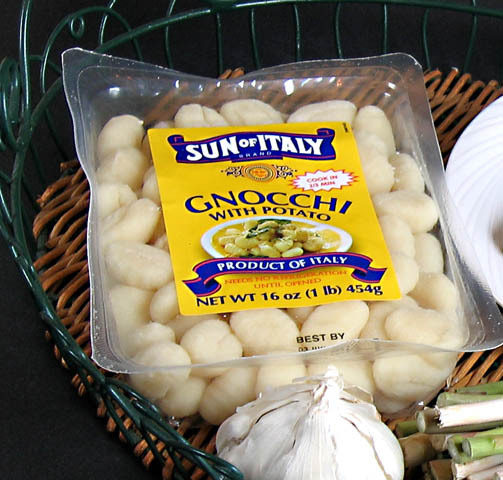 Best of all, they are easily adapted for using fresh ingredients when you have them on hand. For your chance to win a copy of Vegan Unplugged, just leave a comment at the end of this post and tell me what your favorite non-perishable pantry ingredient is. That’s it! The contest ends Monday 11/15 at midnight when a winner will be chosen at random and announced on 11/16. Good luck in the contest and happy MoFo-ing! With no additives and a rich spinach flavor, a jar of spinach baby food is the secret ingredient to these tasty protein-rich fritters. 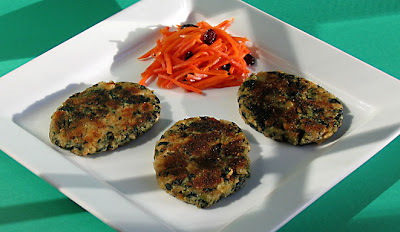 Fresh, frozen, or rehydrated spinach can also be used in this recipe. For more recipes and info about Vegan Unplugged, check out Jon’s blog. 1. In a bowl, mash the white beans. Add the remaining ingredients, stirring until well mixed. 2. Heat the oil in a nonstick skillet over medium-high heat. Shape the mixture into small patties (you can dredge in extra bread crumbs, if you like) and cook in the hot skillet, in batches if needed. Flatten with a metal spatula and cook until browned on the bottom, about 5 minutes. Flip the fritters and cook until the other side is golden brown. Serve hot. 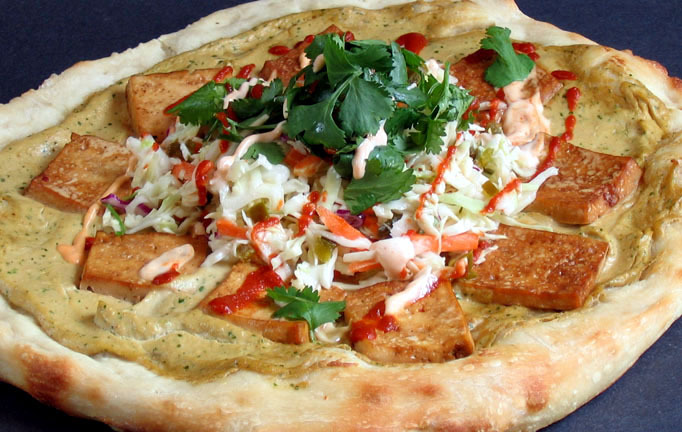 Let me first admit that two of my favorite foods in the world are a bahn mi sandwich and pizza. So it was just a matter of time before I combined the two into one amazingly delicious meal that I appropriately named a "Bahn Mizza." Initially I had my doubts about how well it would turn out, and even tried not to think about attempting it. But with visions of Bahn Mizza dancing through my head at night as I tried to fall asleep, I finally gave in and made one this weekend. Verdict: addictively delicious. It’s so good, in fact, that I just have to put it in my next cookbook, so you’ll have to wait for the recipe until then. But if you like pizza and bahn mi, the wait will be worth it. Now on to the business at hand: My special Mofo Cookbook Giveway! Can you believe there were over 100 comments listing wonderful ways to stuff a cherry tomato (or peppadew)? If I had to choose a winner based on the most delicious comment, I wouldn’t be able to pick just one. Good thing Random.org is able to choose a winner randomly! Everyone else: Check back tomorrow for another cookbook contest giveaway! With the first week of Vegan Mofo coming to a close, I thought I’d end the week with a post I’ll call “Flashback Friday” because it features two recipes that I blogged about a year or so ago. 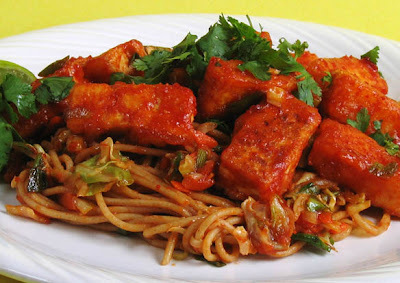 The photo shows Red-Hot Chili Tofu over Vegetable Pancit which are actually separate recipes from my book Vegan Fire and Spice. And while I blogged about each of them separately (and provided the recipes), what I didn’t mention back then is what I did with the leftovers. So here’s the update: As you’ve probably surmised, I served the tofu over the pancit and it made enough for a third meal. Best of all, we enjoyed them as much together as we did separately! Now for a special surprise Weekend Giveaway: Leave a comment at the end of this post to win a coupon for a free container of Nasoya Tofu Plus. This contest closes Sunday 11/7 at midnight, EST. I’ll announce the winner on Monday 11/8. And if you haven’t entered my Special Weekly Mofo Giveaway for a copy of Vegan on the Cheap, there’s still time to enter by commenting at the end of the November 3rd post — that contest closes Monday 11/8 at midnight and that winner will be announced on Tuesday, November 9. Whew, I just exhausted myself keeping all that straight — TGIF! I like to keep cooked brown rice and beans on hand for busy weeknight meals. A quick sauté with onion and or garlic, some herbs and spices, and some fresh spinach, chard, or other vegetable, and I can usually have dinner on the table in about 15 minutes. 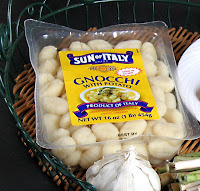 Since pairing white beans with the white gnocchi would look too much like a hailstorm, I opted for slicing up two vegan sausage links instead. While the asparagus roasted, I boiled the gnocchi and sautéed the sausage in olive oil with loads of minced garlic and red pepper flakes. 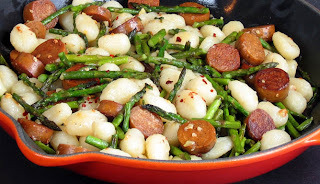 After draining the gnocchi and taking the asparagus out of the oven, I combined it all in the skillet with the sausage and garlic, tossing gently to combine. It was a fabulous meal that was on the table in about 18 minutes. Best of all, I now have a new favorite pantry ingredient to keep on hand. I have a super-busy today today. For one thing, today I’m a guest on the Jazzy Vegetarian radio program. Tune in today at 1:15 Eastern time for some of my favorite party planning tips and the recipe for Sherried Mushrooms from Party Vegan. No matter how busy, there’s always time to make an easy appetizer that can be assembled in seconds, right? Take these Tapenade-Stuffed Peppadews, for example. If you enjoy surprising your taste buds with several flavors at once, you just might like these little peppadew chiles stuffed with tapenade. I happened to have a little tapenade leftover from Halloween and a few of those adorable peppadews in the fridge, so what else could I do but stuff the tapenade into the peppadews? In addition to being cute as a button, these zesty little appetizers pack a flavor wallop. The burst of flavors you get include sweet-spicy, salty, and just plain delicious. If you’re not a fan of peppadews or tapenade, then you can cherry tomatoes and stuff them with something else — but then you'll have to call them something other than "Tapenade-Stuffed Peppadews." Today is the first of a series of my Vegan MoFo Giveaways. To be automatically entered in next week’s drawing for a copy of my book, Vegan on the Cheap, just leave a comment at the end of this post that answers this question: What kind of stuffing would you put in a peppadew (or cherry tomato)? A winner will be chosen at random (using Random.org generator) and announced on Tuesday, November 9. Don’t you love it when two divergent ingredients merge to create something better than you could have imagined in the first place? That’s what happened to me when I needed to use up some leftover momo filling (see this post). I remembered that I had some yuba (bean curd sheets) in the freezer, leftover from when I made my Crispy Stuffed Filet of Soy. 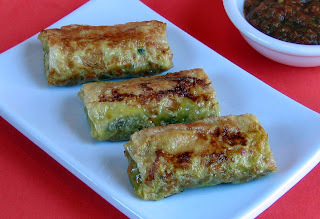 I stuffed the yuba with the momo filling (sauteed shredded cabbage, scallions, and ginger, etc. 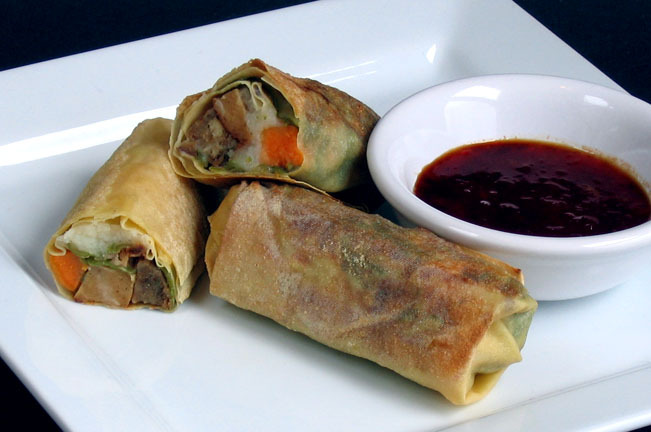 ), rolling them up eggroll-style. I then sautéed them in a little oil to brown them and then baked them for a few minutes in the oven to finish browning and make them crisp on the ouside and hot in the middle. I then whipped up another batch of tomato achar to dip them in and a new favorite recipe was born! Bonus: In addition to being delicious, using yuba as eggroll wrappers are great not only for vegans but also for those who avoid gluten, since many of the eggroll wrappers available in stores contain egg and are made with wheat. In other news…Check out today’s post on GoDairyFree.org — I’m today’s guest blogger! 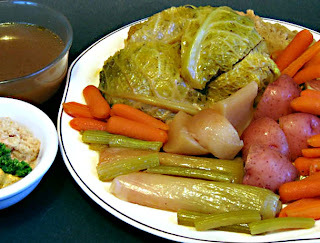 My post includes Thanksgiving tips and the recipe for the rich and yummy Chestnut Bisque from Party Vegan. Vegan MoFo Day 1 - Happy World Vegan Day! It seems like just yesterday it was Halloween…oh, wait, it was! Even though we spent a quiet Halloween at home, I couldn’t resist making some festive orange and black food from the Halloween Menu in Party Vegan. 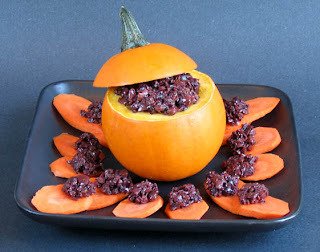 For the rest of my Halloween menu, see this post where you will also find my recipe for Black Bean and Butternut Chili. I’m excited to participate in Vegan Mofo (month of food) for the first time. I think it’s a great idea to show the world how much variety there is in what vegans eat, especially during World Vegan month. During this month I’ll be posting recipes, book and product reviews, and of course, lots of photos. During Vegan MoFo, I’ll also be doing a cookbook giveaway each Tuesday, beginning Nov 9, which will be announced the Wednesday before. Each giveaway will be the usual "comment to enter" style. The winner will be selected at random each week and the giveaways are open to everyone. See this Wednesday’s post for your first chance to enter! Happy World Vegan Day and Happy Vegan Mofo 2010!